A quick swim on a hot summer day is a great way to cool a Shih Tzu down while getting them some exercise. Some Shih Tzu like being around water, and may eagerly jump into it. While another turns away and wants nothing to do with it. In general, most Shih have an instinctual ability to swim. However, they just don’t have the stamina to do it for any length of time. And due to their physical structure, it can be quite a struggle for them to get enough air. Although swimming is a great way for a Shih Tzu to get exercise, they simply aren’t built for a long strenuous work out. Brachycephalic (narrowed nostrils and partially obstructed airways) dog breeds such as the Shih Tzu already have a hard time breathing. When swimming a Shih Tzu has to extend his head way back to keep his short muzzle out of the water. This makes breathing in air even more difficult for them. And since a Shih Tzu has short legs, they have to use more energy than a long-legged dog, to propel themselves forward. 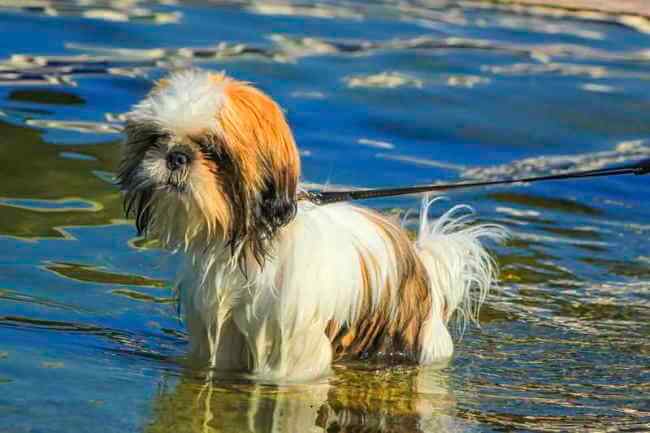 This, in addition to his breathing difficulties, causes a Shih Tzu to get tired within minutes of beginning his swim. Another matter to consider is the Shih Tzus coat. Once saturated this coat can become quite heavy and pull them down under the waters surface. These are some pretty significant issues to consider, when swimming with a Shih Tzu. But it doesn’t mean that a Shih wouldn’t enjoy going for a swim with you now and then, as long as you’re sure he knows how. Although swimming is an instinct most dogs have, some won't go anywhere near the water. It may be they were never exposed to it before and don't realize they can swim, or they've had a bad experience with it. Did you learn how to swim by being thrown into the lake, but instead of swimming you sank? If so, then you know how scary this can be. I would advise you not to teach your dog this “swim or sink” method. Sure, he could start paddling his little legs in survival mode and make it safely back to dry land. But this may ultimately end up teaching him to fear the water. There is a better way to teach your dog to swim. Use a life jacket made for dogs. You don’t necessarily need one to teach him to swim. But when wearing one, it can make it less strenuous and traumatic for his first time. A life jacket will also help him to keep his head above water if he’s having trouble staying afloat. Choose a Safe Place for His First Time. A calm, quiet lake or pond, or a backyard pool is best when first exposing your Shih Tzu to swimming. The roar of the ocean can be too overwhelming for them and the currents are too strong for this little dog. A rogue wave can catch you both off guard, easily dragging him under or sweeping him away. You should always use caution when taking your Shih Tzu swimming in the ocean. Let him get used to the water. The goal is to get him comfortable being in the water, and that it isn’t a scary place to be. Slowly introduce him by submerging only his paws in shallow water, while you are sitting beside him. He may be skittish at first. But with you sitting next to him and encouraging him with praise, may make him feel more relaxed. Once he's seems comfortable with just his paws being wet, carry him out a few steps deeper into the water. Allowing the water to come up over his stomach. Then walk back toward the shallow water. Repeat going back and forth a few times until he becomes okay with it. When you are about waist deep in the water, place your arm under his midsection and lower him into the water. Be careful to avoid submerging his face. Swimming is instinctual in some dogs, and this should be where he should start paddling his legs. Keep supporting his weight until he is able to do it on his own and starts swimming. Slowly letting go once he gets the hang of it. If at any time he begins to struggle, calmly use your arm to support him again. Show him how to get out. Even if your Shih Tzu is a good swimmer, he can find himself not being able to get out of a pool if he falls in. So it’s very important he knows how to get out. Guide your dog toward dry ground by calling him as you walk toward the shoreline or pool steps. Keep an eye on him for fatigue and stay no more than an arms length away from him at all times. Attach a ramp, like the Skamper Ramp, to the side of your pool if the steps are too deep or there is only a ladder. When teaching your dog to swim, you need to have patience. Be prepared to stop if he becomes anxious. It can take several tries before your Shih Tzu feels comfortable being in the water. And it could be several days before your Shih Tzu becomes calm enough to try a new step. Encourage him with lots of praise for every step he does. Let him know that his learning to swim brings him rewards. I recommend holding them as they are getting used to the water as it's less traumatic for them. You could certainly use a leash and walk them into the water. But if they are feeling even a little uneasy, they will dig in their heels and refuse to go further. You never want to force your dog into the water by dragging them. This will be very unpleasant for them, and could create a distrust between you and this little dog. One of the most important ways to keep your dog safe is to never leave them unattended near water. Use a barrier around the pool to keep your family and pets from accidentally falling in. Pool covers will not keep your dog from drowning as they can get tangled in them and become trapped under water. 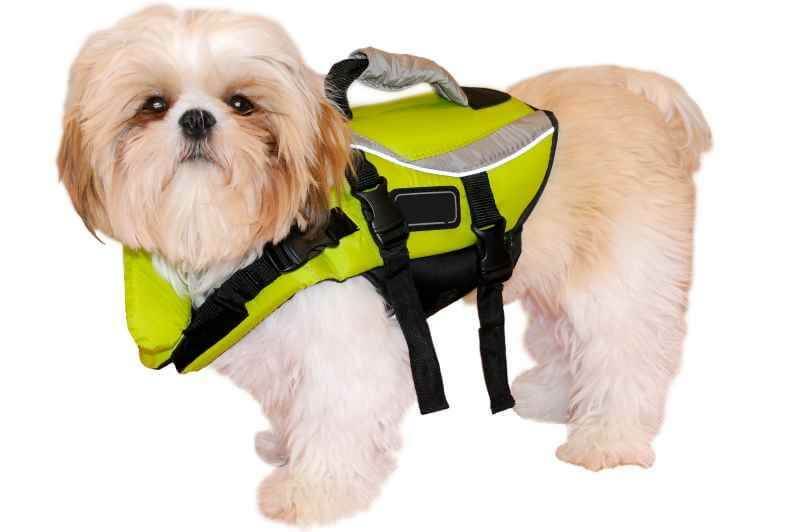 A doggy life vest should be used when your dog is in the water. This will help keep his face above the water should he become exhausted while swimming. Don't allow your dog to use the pool as a water bowl. Not only is it full of harmful chemicals, but he may fall in while leaning over to take a drink. If you catch your dog drinking from the pool, get his attention by clapping your hands together and loudly and say “no.” Then re-direct him to an actual water bowl. Learn CPR for dogs. This could save your dogs life. 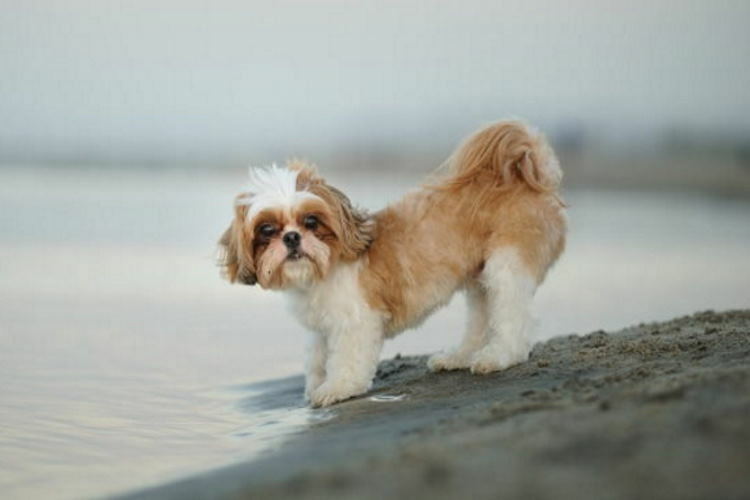 Thoroughly rinse your Shih Tzu coat with clean fresh water after they have been in a pool or at the beach. Chlorine is added to pools to kill bacteria, but unfortunately it also strips the skin and coat of their natural oils causing itchy skin and a dull, dry coat. The Amercian Kennel Club article on "Water Dogs" offers some great advice on caring for your dog after they've gone swimming. Most dogs can swim...some just do it better than others. And not all dogs care to be in water, while others love it. One thing to remember is Shih Tzu are prone to colds and chills, so after they have been in the water, dry them off thoroughly. Be sure to clean and dry their ears as well, as they can be prone to infections with excessive moisture. Be sure to provide plenty of cool fresh water. And a nice shady area for where he can stay cool while hanging out on the beach or the backyard. Remember they are prone to overheating. Watch for any signs of rapid panting, vomiting, collapse and loss of consciousness. Should this happen, try cooling him down by pouring cool water over him. And have a plan to seek medical attention. If you don't have access to a swimming area, a kiddie pool is a good alternative. Or if it's too cold to go swimming outside, fill your bathtub with warm water and give them a head start on his lessons.